Go North EastProviding details on bus travel in Newcastle.National Rail EnquiriesHome page of the National Rail Enquiries WebsiteNexus TransportTransport for the Tyne and Wear area. 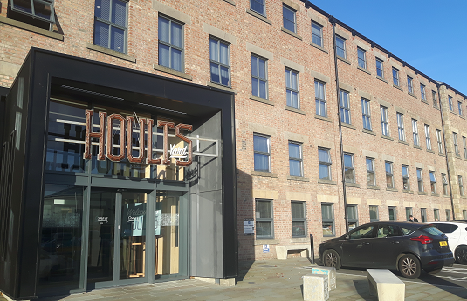 You can catch the Q3 bus from the centre of Newcastle (Haymarket Bus station or Grey Street) to the entrance to Hoults yard. Alternatively the Q3 is a park and ride service, so you can park in the car park to the north of Newcastle, and catch the Q3 to Hoults Yard. The Q3 bus stops outside the entrance to Hoults yard on Walker Road. Please see the Quaylink Bus route map in the related documents. Turn right out of the station and take the pedestrian bridge over the A193. Turn right onto Conyers Road, with the Byker wall on your left-hand side. Continue along Conyers Road until it turns to the left. As Conyers Road turns to the left onto Dalton Street, the footpath towards the quayside should be visible on the left-hand side. Take the entrance onto the footpath towards the quayside. Continue on the footpath for 300 yards. On the left-hand side the boundary wall of Hoults yard will appear. Eventually you will see a metal gate door appear which is a short-cut through to Hoults yard. Walk up the the verge to the metal gate through to the yard. Walk through onto the main courtyard of Hoults yard. Walk past the clock tower café and walk down the road heading towards the underpass. As you reach the underpass, take the entrance to unit 45 on the left-hand side. Lhasa’s office is the third door on the right-hand side. Please see the Metro map in the related documents.